This calendar lists religious and national holidays and observances that involve special worship obligations or food or work restrictions. The listings are not exhaustive, nor do they represent all religious traditions in the Interfaith Action community. Every effort has been made to ensure that this information is accurate. If we have missed an important date in your faith tradition, please let us know. 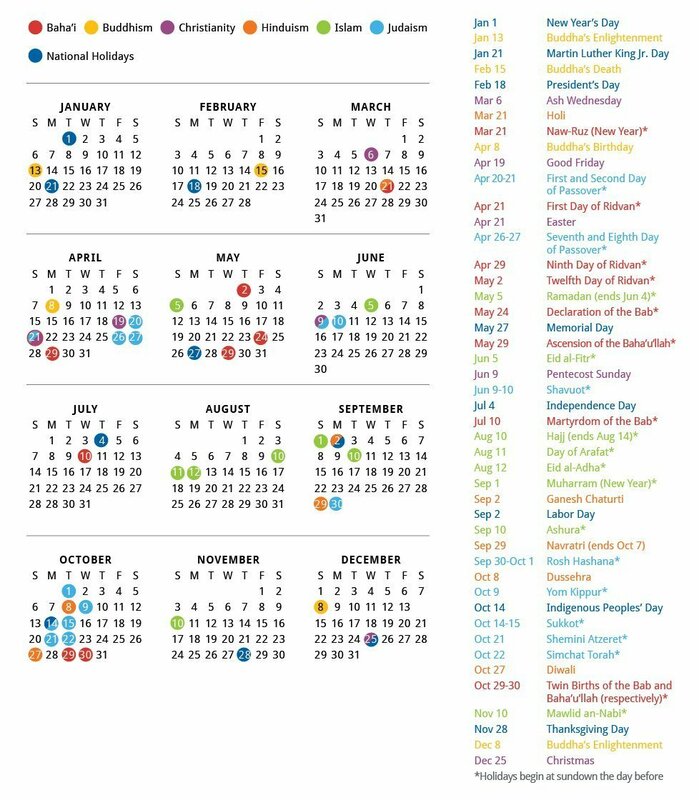 Click to download a printable pdf of the Interfaith Action Holiday Calendar. There are nine annual Bahá’í holy days plus an annual fast. With the exception of New Year, Bahá’í holidays commemorate major events in the lives of the founders of the Bahá’í faith. On holy days, Bahá’ís do not work. The annual fast takes place during the Bahá’í month of Alá, which immediately precedes the Bahá’í new year. Bahá’ís observe a feast that occurs once in each 19-day Bahá’í month. There are 19 feast celebrations each year. Buddhism celebrates many holidays and festivals, most of which commemorate important events in the life of the Buddha or various Bodhisattvas. The date of the holidays are based on the lunar calendar and often differ by country and tradition. Buddhists do not observe a weekly holy day. Some Buddhists, however, observe Uposatha, or a day of resting. The most important Christian holidays are Easter, which celebrates Jesus Christ’s resurrection and Christmas which commemorates the birth of Jesus. The 40 days prior to Easter, starting with Ash Wednesday and excluding Sundays, form the Lenten season, a time of fasting and repentance. There are numerous Christian feasts throughout the year. Christians generally celebrate Sabbath on Sunday, a practice that began after Biblical accounts of Jesus’ resurrection. As in most ancient religions, many of the Hindu holidays are based on the cycle of nature. They mark the change of seasons, celebrate the harvest, and encourage fertility of the land. Others are dedicated to a particular deity, such as Shiva or Ganesh. Still other popular holidays commemorate events in the lives of Rama or Krishna. There is no set day for worship in Hinduism. Worship is less formal than some other religions. There are two major Islamic holidays: Eid-ul-Fitr, “Festival of Fast-Breaking,” which marks the end of Ramadan, a holy month of fasting, and Eid-ul-Adha, “Festival of Sacrifice,” celebrated during the Hajj. In addition, a few other celebrations are recognized in the Muslim community that vary across cultures, as well as across sects of Islam. Mawlid an-Nabi celebrates Prophet Muhammad’s birthday. Muslims are required to offer five prayers daily and have a special day for congregational prayer on Fridays. In Judaism, life is marked by numerous special days. The Torah lists the following sacred days: the Sabbath; the three pilgrimage festivals Passover, Shavuot, and Sukkot; and the two High Holy Days Rosh Hashanah and Yom Kippur. Judaism developed additional significant days from the time of the destruction of the Second Temple to modern times. Sabbath for Jews is known as Shabbat and runs between Friday and Saturday evenings.